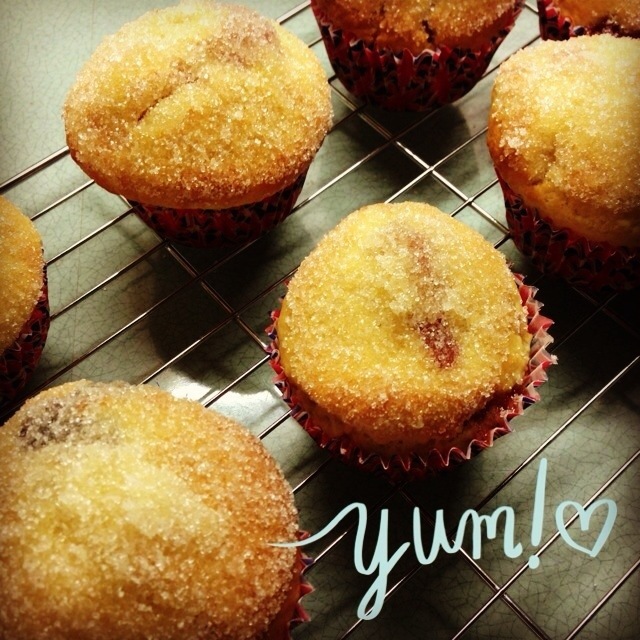 On Sunday I added a new recipe into my baking repertoire – jam doughnut muffins! Why have I never heard of them before?? Line a 12-cup muffin tin with cases. Lightly beat the eggs in a jug, then beat in the milk, oil and vanilla extract. Pour the liquid into a well in the centre of the dry ingredients. Stir gently until everything is just mixed together, no more. Spoon half the mixture into the muffin cases. Spoon the rest of the mixture into the cases. Bake for 20 minutes until golden brown. Test the muffins are ready by pushing a skewer into the centre. If the skewer comes out clean, the muffins are ready! Leave the muffins to stand in the tray for a few minutes. Melt enough butter so you can hold each muffin upside down and dip it in the butter, coating the top. Then dip each muffin in granulated sugar and place them on a wire rack to cool. If you give them a try, please let me know how they turn out! Previous Handmade / Apple corrr! Next Homemade / Ice, ice cream testing, baby!